Circle time is a special time for young children (typically preschool age) to engage in a variety of learning tasks in a small-group setting. Circle time often occurs during the first part of the day and functions as a "warm-up" for the day. The children sing songs; review the days of the week, months of the year, colors, shapes, and numbers; say rhymes; play instruments; read storybooks; and even participate in movement games. Teachers incorporate simple to more complex activities depending on the ability levels of the children. In addition, a speech-language pathologist (SLP) can play an important part in helping children develop communication skills during circle time. Which Communication Skills Can the SLP Target During Circle Time? What Are Some Circle-Time Language Activities? Storybooks - Read storybooks to enhance vocabulary, memory, pre-reading skills, and focus. Ask the children questions and encourage them to ask questions. Puppets - Use puppets "to bring the stories to life" through animation. The children work on motor movement, imaginative skills, and turn-taking with classmates. Books with sign language - Provide nonverbal communication support and reinforcement to work on language skills and maintaining attention. Felt board - Provide visual and tactile (touch) feedback. Use story characters, The Three Bears or The Three Little Pigs, for example. Interactive Sing-Along Big Books - Teach new vocabulary and work on focus and listening skills. 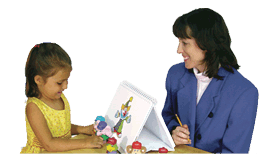 Children manipulate different Velcro® pieces such as "putting crayons in a box" or "putting a funny face on a clown." Stuffed Animals or Animal Pictures/Magnets - Bring in different stuffed animals or pictures/magnets of animals (such as sea creatures, farm animals, etc.) and have the children describe them-where they live, what they eat, what other animals they look like.